The speaker gets its name from its water-resistant enclosure—you can even rinse it off under a faucet. BERLIN—Water and electronics don’t usually mix, but the Pulse 2 Bluetooth speaker that JBL announced Thursday at IFA can not only withstand a beach-side splash, you can rinse the sand off of it by placing it under a faucet. But what’s even more fun is watching the 100 LEDs arrayed around its cylindrical enclosure dance and pulse to your music. You can also program the LEDs to create abstract shapes and animations, including campfire flames, fireworks displays, and dancing fireflies. Point the onboard camera at any surface, push a button, and the LEDs will incorporate that color into their routines. If you have several Pulse 2s, you can link them together over a wireless connection so they'll play the same music. Pick up and shake the master speaker, and the other ones will mimic the colors and patterns cycling through its LEDs. 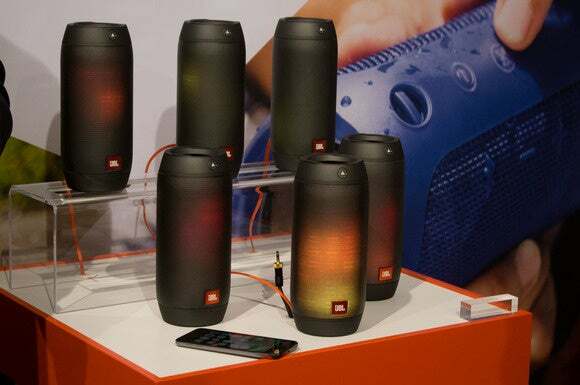 JBL's Pulse 2 comes in a sturdy enclosure that can take a beating. This isn’t a full review, but the little speaker sounded surprisingly good within the confines of JBL’s booth, which was far from the show floor and relatively quiet. Passive radiators on each endcap deliver solid bass response for a speaker of its size. The speaker is rated to run for 10 hours on its rechargeable Lithium-ion battery. Why this matters: The Bluetooth speaker market is exploding right now, and manufacturers are scrambling to come up with features that will set their products apart from the competition. The LEDs on the Pulse 2 certainly fulfill that mission, but if my demo was a good indication, JBL hasn’t sacrificed audio quality in the name of a gimmick. The Pulse 2 will be available later this month at a list price of $200.